Back in 1983, Konami released Track & Field (in America), also known as Hyper Sports (in Europe and Japan). It was a seminal arcade game that set the tone for arcade sports games for decades afterwards, and is to this day fondly remembered by a huge number of people who grew up playing it. Hyper Sports R is an upcoming Nintendo Switch title that aims to recreate the original for modern players. Based on a hands-on with it at Tokyo Game Show, I think we're in for a good time with it. The original Track & Field/ Hyper Sports was a button masher in the very most extreme sense; in each and every event the complex mechanics of the sport were boiled down to a simple reality; whoever pressed the buttons the fastest would get the best times. On the Switch with Hyper Sports R, things are still kept that simple, but now with motion controls. Hold a Joy-Con in each hand, and swing your arms at the right pace to hit top speed, flick the arms up at the right moment to hit the right angles to successfully long jump, and so on and so forth. Anyone going into this expecting some kind of complex simulation isn't aware of the heritage of the franchise, but I suspect most people that might be inclined to pick up Hyper Sports R purely on its premise will get right into the spirit of it, and enjoy it for what it is. What Hyper Sports R is best at is fostering competition in multiplayer. 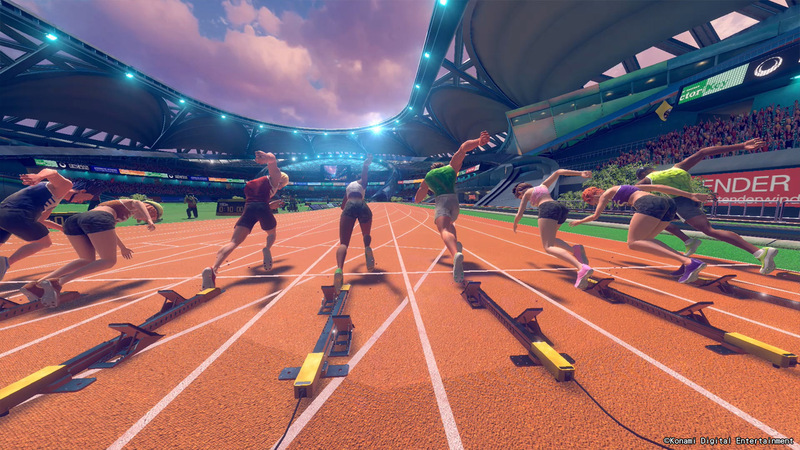 It's the kind of game where beating your friends and family by fractions of a second in the running event, or by a centimetre in a throwing event is everything that you need. You'll be able to gloat over your successes then. There's enough technique to the motions, and the motion controls work well enough, that Hyper Sports R felt consistently fair in my hands-on time, and winning by those tiny fractions were a result of having ever so slightly better technique. Backing this up is some really enjoyable presentation. Character models are the right side of silly, and the bright, light aesthetics help to make this a game that everyone can enjoy picking up. I was only able to play two events - the 100 metre sprint and the triple jump, so I don't know what kind of depth there is beyond the events themselves, but honestly, I wouldn't expect too much. Just as way back in 1983, the real appeal of these games is in short bursts of multiplayer fun, and I'd be surprised if this one is any different. There will be some that dismiss Hyper Sports R on that basis, but I simply had so much fun with it at TGS that, while I don't think it'll become a most played, it'll also be the one I pull out first at parties. Instantly accessible, hugely charming, and yet highly competitive, this will be the multiplayer game for people who find the likes of Overcooked and Towerfall to be too much.